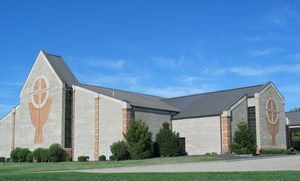 Precious Blood Parish is a warm and caring community that strives to meet the needs of each family member. This community works together: To live out its baptismal commitment; To maintain a major link between life and religion; To support Catholic education and the Religious Education Program. Precious Blood of our Divine Savior Catholic Church, known to Jasper residents as simply Precious Blood, celebrated its 50th Anniversary as a parish on August 29, 2004, with Bishop Gerald A. Gettelfinger celebrating the special Mass with our Pastor, Father John Breidenbach. Precious Blood is the newest of three Catholic Parishes serving the city and surrounding area. In 1954, Bishop Henry Grimmelsman purchased ten acres from the William Lechner farm for $8000 (an additional four acres were purchased in 1967). The parish was planned along Highway 56, West Sixth Street. The territory of the new parish was to come from St. Joseph’s Parish. The boundaries were set up as: Ireland parish on the west, the Patoka River on the south, Highway 231 and Dorbett Street (including an imaginary extension to Schuetter Road) on the east and Schuetter Road on the north. In August 1954, the Reverend Ralph Endress was assigned as founding pastor. For the first three years, members continued to gather at St. Joseph, along with that congregation, which gave the new parish great support. In 1956, enough money had been raised so that building plans could be made. It was diocesan policy that every new parish builds first a Catholic elementary school. Precious Blood’s plans called for classrooms for the school, as well as an attached gymnasium structure which would serve as the congregation’s church. The pastor and the Sisters of Providence, who taught in the school, were also to have their quarters in the building. During 1956 /57, the major parish building was constructed. When completed, the cost was about $450,000. By October 1957, it was ready to go into service. The school opened on October 28. Bishop Grimmelsman celebrated a Solemn Mass to dedicate the building on November 24. At the time of moving into the building, the parish had 201 families and 889 members. Through the next ten years, the parish grew steadily. In 1967, a second phase of building began. Until this time, the Pastor and Sisters had lived in the quarters located in the one building with the school and church. Now that space was needed for classrooms and a library. Two new buildings were built. A convent for the Sisters was built south of the main building. A home for the pastor was built west of the church, on Lechner Lane. These buildings and furnishings cost $122,000. At the end of 1967, the parish had 281 families and 1,285 members. Father Ralph Endress remained as pastor for another ten years until 1977 when he was assigned as pastor of the Old Cathedral in Vincennes. When he left, the parish had 324 families and 1,342 members. Msgr. Leo Conti followed Father Endress as pastor for three years. In 1980, Father Joseph Kane was appointed pastor. The first census showed 375 families and 1,238 members. Families were now generally smaller and the many children of the original members were moving from their parents’ homes. Reflecting changes in the Catholic Church, new organizations were instituted for the direction of parish life. A Board of Education directed the operation of the Parish School and Religious Education program. Committees for Social Concerns, Welcoming, Finance, Buildings and Grounds, and Development were created. These committees joined longstanding parish organizations such as, Men’s Club, Women’s Sodality, Choir, Saint Vincent de Paul Society, Interested Parents and Teachers, and Quilters, to guide and support parish life. Father Kane installed Readers of the Scriptures, Ministers of Communion, and Sacristans for worship. The parish staff was expanded as Sr. Marym Gootee, S.P., became the first Pastoral Associate for the parish. Along with other service, Sister Marym created a major aid for the growing parish by beginning the publication of a monthly newsletter, “The Voice”. Approximately at the same time as Father Kane arrived; a “building boom” began on Jasper’s west side. By 1988, as the parish celebrated thirty years “on location”, it numbered 488 families and 1,501 members. Sr. Marym Gootee retired as Pastoral Associate in July 1988, and Sister Millie Giesler, S.P. accepted that position of service within the congregation. The school continued to thrive although now reorganized as a Pre-School through Fifth Grade school instead of the original First through Eight Grade school. An important look toward the future was made with the inception of a Precious Blood Endowment Fund. Conceived as a way to assure stable income into the future as well as keeping the memory of contributing members in the prayers of future members, this project is approaching the two million dollar reserve. At the arrival of the 1990’s, new changes were in the making at Precious Blood. Because of the continued growth of the parish, in 1992 a Building Planning Committee was formed. This committee was charged with the responsibility of studying the improvements and expansion needed to the original parish building to meet the requirements of today’s schools as well as to serve the needs of all parishioners. Sister Millie Giesler, along with Father Kane and the members of the Building Planning Committee, attended many meetings and planning sessions to oversee the construction of the new facilities. Sister Millie retired in August 1997. Sister Betty Koressel, S.P. accepted the position of Pastoral Associate to continue the work in parish life as well as resume the tasks on the Building Planning Committee. The parish celebrated its fortieth year at the present location in November 1997. With the dedication of the new facilities on Saturday, March 14, 1998, parish building space more than doubled. Bishop Gettelfinger consecrated a new church as well as the greatly expanded school, parish and office areas. The 40th Anniversary of the parish witnessed the fact that there were 666 families and 1,971 members in Precious Blood Parish. On July 3rd 2002, Father Joseph Kane moved to his new assignment; Good Shepherd Parish in Evansville and Father Joseph F. Erbacher arrived as our new pastor. Because of the growth of school enrollment, the Board of Education Committee researched and designed a plan to accommodate the incoming students that were moving into the area. Classrooms replaced parish space in the school area. In order to accommodate parish space, a house was purchased at 1517 Gregory Lane for the new rectory. The Sisters moved out of the old convent into the previously occupied rectory. The old convent became the Parish Center that would contain parish meeting rooms and parish offices. On June 9, 2004, Precious Blood saw another change in its leadership. Father Joseph F. Erbacher moved to be pastor of the Martin County Catholic Parishes. He resided at and administered from St. John’s in Loogootee. Father John V. Breidenbach arrived in time to lead the parish in its celebration of 50 years as a parish. During Father John’s leadership, the Rite of Christian Initiation (RCIA) was fully implemented, the Endowment program saw an increased focus, and tuition was established to ensure the continued health and success of Precious Blood School. Stewardship and community building among parishioners have a new energy in the parish. In October 2006, a baby grand piano was purchased to enhance the singing during the masses throughout the year. The organ is still a vital part of the Liturgy; however the piano offers another enhancement to the full participation of those attending mass. Through the generosity of parishioners an friends, this goal was accomplished. Fr. Gary Kaiser, our current pastor, arrived in July of 2009. The congregation continues to grow, generously giving of their time, talent and treasure, and passing on to their children the outstanding vibrant faith that was given to them. We have much to celebrate in our parish family, gratefully acknowledging God’s many blessings to us. The parish presently has 700 families and 2,169 members to continue the wonderful legacy that is Precious Blood Parish.